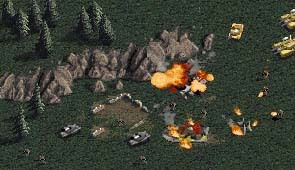 Command & Conquer comes from Westwood Studios, the team behind award-winning titles including Dune 2: The Battle For Arrakis, Lands Of Lore and the Legend of Kyrandia series. A wide range of missions with varied objectives and sometimes multiple goals. The stark horror of conflict is punctuated by over 40 minutes of vividly rendered cinematic presentation comprising news footage, commercials, mission briefings and cut-scene rewards. Large, mean-looking, detailed hardware to wreak havoc with including VTOL Orca Fighter Craft, Raptor Attack Cycles, Devil's Tongue incinerator tanks, Air Cushioned All Terrain Landing Craft and the Mammoth Heavy Battle Tanks (to name just a few). Modem and network play make this game of world dominance a truly global affair. A delicious, heavy-duty soundtrack featuring digitized speech and musical styles including Cyberpunk, rap, hip-hop, house and eerie atmospherics. Direct Audio Streaming allows music, speech and sound effects to be played simultaneously on more sound cards than ever before. Sound Card: Sound Blaster (all models), ESS: 488, 688, 1488, 1688, Mediavision (most models), Aztech: Nova 16, Washington 16, Rocky 2 or any Microsoft DirectSound supported card. stack (requires ISP connection over 28.8k baud modem or direct Internet connection such as ISDN or T1).